The Yarn and Fiber Company is proud to announce that a lace workshop with Galina Khmeleva will be held in the beginning of the week of July 20 (right before TKGA). Galina and I are still working on the format of the workshop and the exact dates but it is sure to be a wonderful class - she is awesome! Please give me a call if you would like to be added to the call list - this will be a first come, first serve class and is sure to fill fast (603/898/5059). If you are coming from out of state and need help with hotel bookings, etc. please let me know and I happy to help on this end. So extend your stay for TKGA and enjoy Lace with Galina, then onto the TKGA 10 miles up the road. What a great week! 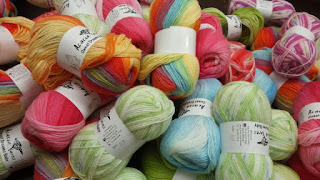 and Also, we have just found out that designer Louisa Harding will be visiting The Yarn and Fiber Company in April, 2008. YEAH! Stay posted for the exact time and date... we have it narrowed down to one of the following days, April 16, 17 or 18th, but Louisa's schedule is not set yet. I will let everyone know the exact time and date as soon as we know.